In addition to functionality, profiles also need to be aesthetically pleasing, this was best highlighted through our work with JSC Minsky Avtomobilny Zavod (MAZ), one of the largest automotive manufacturers in Eastern and Central Europe. MAZ required a decorative cover strip that would be clipped into an aluminium drain section that runs along the surface of the bus chassis. To accommodate this, we introduced a post extrusion embossing machine that rolls the desired pattern onto the profile. It was important that the profile would run continually along the length of the bus. MAZ supplies buses from Russia to Cuba meaning the profile needed to accommodate a varying range of temperatures. 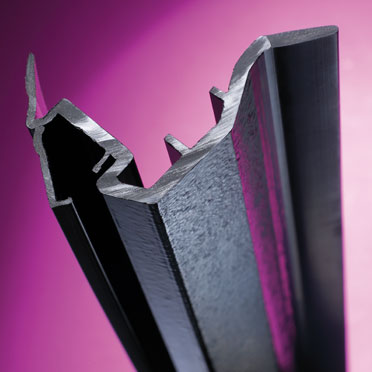 This was achieved by extruding the profile from a material that is resilient to both frost and ultraviolet rays, guaranteeing stability of the profile.